CHICAGO — In the entire history of art, how many works depict a tree as their main subject? The answer is probably incalculable, but even attempting to imagine it makes the mind dizzy, like trying to grasp the mathematical concept of infinity. Yet in two group shows in Chicago, one sees a range of artists wringing new meaning from our leafy friends. In Roots, at Linda Warren Projects, 18 artists were invited to show work that illustrates their own relationship to trees. As evidenced by a catalogue of short artists’ statements that accompanies the show, many of the artists have personal associations with trees, while others use the tree as a formal pictorial or sculptural device. Thus we have more or less straight depictions of trees in paintings, photos, and sketches by Tom Torluemke, Tom Van Eynde, and Brenda Moore; small paintings of evergreens in lurid, Pop-art colors by Chris Uphues; and whimsical paintings in which cartoonish characters pose in the middle of forests, as in Nicole Gordon’s “Curiosity Often Leads to Trouble.” That painting seems to be a form of throwing one’s hands in the air when confronted with the long and weighty tradition of landscape painting, almost as if poking fun at the whole enterprise. 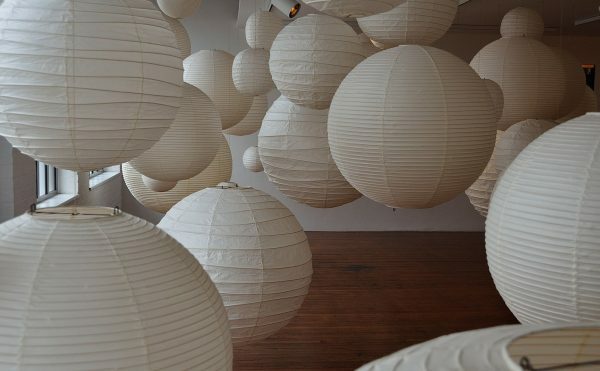 Better and more convincing responses can be seen in the more abstract works, such as Emmett Kerrigan’s sculptures or Nina Rizzo’s paintings, which both use different dimensions of wood pieces and play around with their weight in space. The wisest moves seem to occur when artists forgo color altogether: Joseph Noderer’s “Bigfoot Creek” is a tall canvas of interlocking monochromatic shapes that nevertheless uses strong contrasts to imply different colors; and in Michiko Itatani’s “CTRL-Home/Echo,” the artist has forsaken representation altogether and made an image that looks totemic. 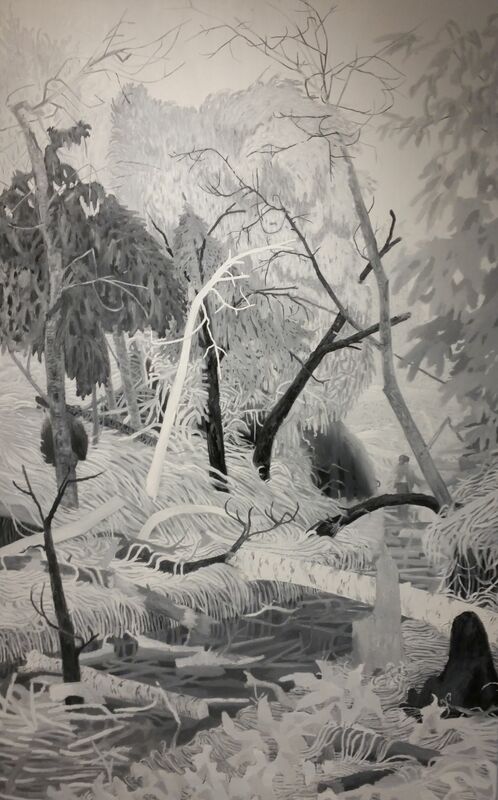 Apotheosis, at Matthew Rachman Gallery, is a two-person show by African-American artists Spencer Hutchinson and Cleveland Dean that introduces a slightly different, more social angle on trees. Hutchinson works with street posters and acrylic mixed media, his paintings veering between representation and abstraction in a way that suggests an artist still looking for his voice. 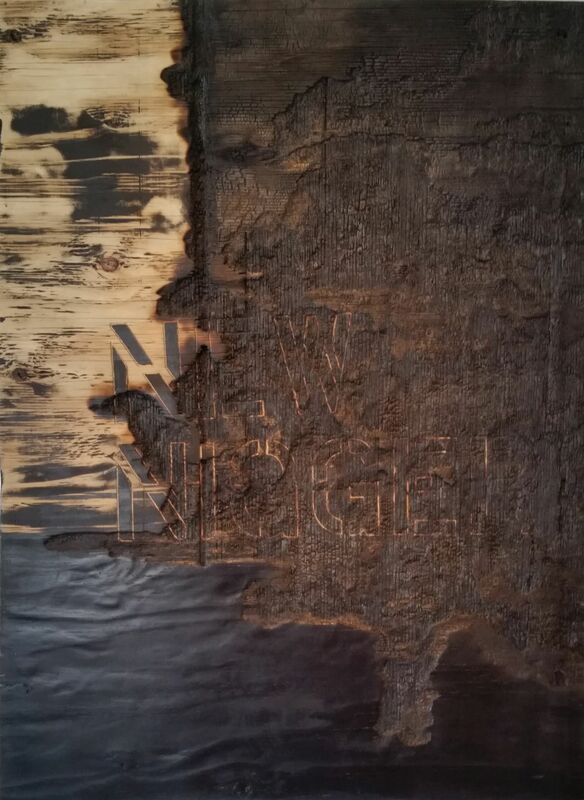 Cleveland Dean, whose work takes up most of the gallery, has created an impressive body of work out of wood panels and pigment that he burns almost beyond recognition, using repeated applications of a heat gun. The wood grain of the plywood panels is often visible, but sometimes it is obscured by dried pools of paint and almost always overlaid by a dense surface of charred wood, as though the wood had been retrieved from a particularly serious house fire. Dean gives his pieces somewhat grandiose titles, such as “Manipulation of Synthesis or Other,” or “Man-King-God-Non Believer.” But here and there he cuts or burns phrases into the surface that imply a more political, less aesthetic awareness. When looking at the phrase incised into “The Glorious Realization of Uncomfortable Power,” one senses the angry energy it must take to create these pieces that reflect on the black frustration that is demanding our attention at this moment in US history. And perhaps it’s not too fanciful to see in Dean’s fire-blown panels some echoes of the all-too understandable fires that have raged in communities over the last year as a result of yet another police killing of an unarmed black person. In a catalogue for a recent exhibition at Stanford called Arboreal Architecture, art historian George Philip LeBourdais wrote about “the tree-like structures of knowledge that help us make sense of the world by providing visual models that teach basic ideas like growth and connection.” The work on show at these two Chicago galleries suggests that landscape, and specifically the tree, still has its uses as a means of expression for artists, whether the intention is to depict the pleasures of nature, or to engage in a form of social protest. Roots continues at Linda Warren Projects (327 North Aberdeen Street, Chicago) through August 15. 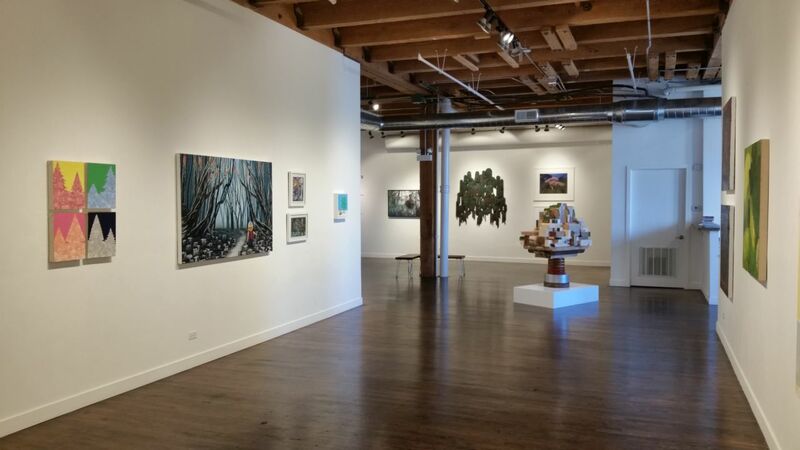 Apotheosis continues at Matthew Rachman Gallery (1659 West Chicago Avenue, Chicago) through September 6.